With the presence of a large pool of participants, the Global bitumen market is displaying a highly competitive business landscape, finds a new research report by Zion Market Research (ZMR). Bouygues S.A., China Petroleum and Chemical Corporation, Villas Austria GmbH, ChevronTexaco Corporation, JX Nippon Oil & Energy Corporation, ExxonMobil, Shell Bitumen, and British Petroleum are some of the key vendors of bitumen across the world. These players are focusing aggressively on innovation, as well as on including advanced technologies in their existing products. Over the coming years, they are also expected to take up partnerships and mergers and acquisitions as their key strategy for business development, states the bitumen market study. Citing an instance, on September 17, 2018, SinoCan Global, Teedrum, Sinopec, and China Construction proposed to construct bitumen upgrading & petrochemical refining unit in Alberta in Canada. Analysts predict that the move can contribute significantly towards the bitumen market revenue in the coming years. 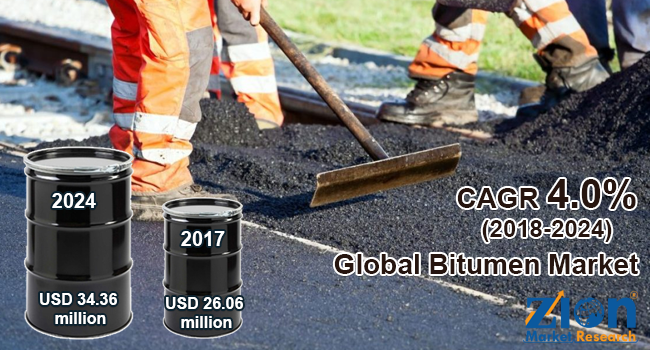 As estimated in this report, the global bitumen market stood at US$ 26.06 million in 2017. Witnessing a tremendous rise during the period from 2018 to 2024, the revenue in this bitumen market is expected to reach US$ 34.36 million by the end of the forecast period. The main products available in this bitumen market are paving grade bitumen, oxidized bitumen, cutback bitumen, polymer modified bitumen (PMB), bitumen emulsion, and others. Among them, the demand for polymer modified bitumen (PMB) is relatively higher and the trend is anticipated to remain so over the next few years, notes the research report. “Rising product demand across the construction & infrastructure sectors in emerging economies is likely to change the growth phase of bitumen market in the ensuing years,” says the author of this study. Apart from this, massive government investments in construction projects are likely to proliferate the expansion of bitumen market in the years ahead. Enforcement of strict laws pertaining to the use of bitumen and elongated supply chain activities witnessed in the product delivery, however, can obstruct the progression of bitumen market in the years ahead. Regionally, Asia Pacific has been leading the worldwide bitumen market and is anticipated to continue on the dominant position in the years to come, states the bitumen market study. Mammoth expansion of the construction industry along with slew of infrastructural developmental activities witnessed across the countries such as China, India, Thailand, and Vietnam in the region is the main factor behind the dominance of the Asia Pacific bitumen market. The presence of key market players such as British Petroleum, ExxonMobil, and Shell Bitumen in Asia Pacific is another significant factor that is supporting the demand & growth of this regional bitumen market. Furthermore, robust road infrastructure observed in the countries of the region will raise the product demand during the forecast timeframe.